255 pages | 130 B/W Illus. This book explores the intersection of craft, design and sustainability in the developing world. It argues that most sustainable design approaches and efforts fall short of implementing holistic sustainability and in order to reach this goal, design must be underpinned by alternatives to the mainstream, technology-intensive, industrial design paradigm. Renewable materials such as bamboo, cork and hemp - which are abundantly available in the developing world - have the potential to be a viable resource base for sustainable development. Current sustainable design initiatives and approaches already recontextualize these materials using industrial techniques and technologies. However, these efforts fall short of impacting holistic sustainability and tend to focus on the ecological aspect. This book offers the development of one alternative to design for holistic sustainability, called the Rhizome Approach, which draws on existing sustainability praxis and craft. Holistic Sustainability Through Craft-Design Collaboration includes customizable tools which aim to empower designers to guide and evaluate their own designs. Through these tools, and the Rhizome Approach in general, the book aims to enable designers, and students of design, to move beyond green and sustainable design, to holistic sustainability design. 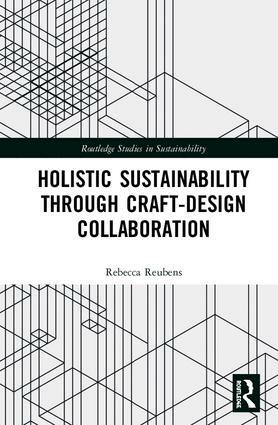 Rebecca Reubens did her Ph.D. on the intersection between craft, design and sustainability at Delft University, the Netherlands. She practices in the same domain through her sustainability design firm Rhizome, and is an ambassador for the World Bamboo Organization.